A surgeons view of a robotic heart surgery valve operation. Featuring an interview with Clifton Lewis MD director of the robotic heart surgery program at Princeton Baptist Medical Center, Birmingham, Alabama, a world leading robotic heart surgeon who answers some commonly asked patient questions on robotic heart surgery. Wound healing in traditional vs robotic heart surgery. 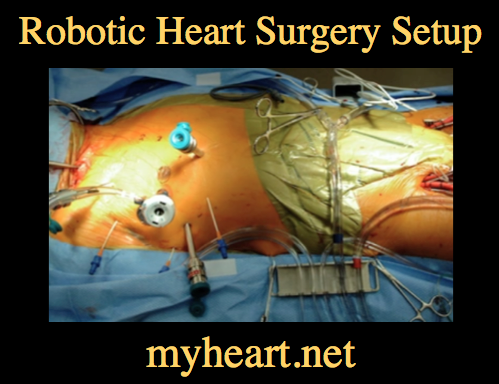 In this article we will talk about robotic heart surgery, and describe the situations where its use is ideal. In the right hands robotic heart surgery can be incredible, but in the wrong hands it can be less than ideal. The key to robotic heart surgery is careful case selection and a highly experienced team that will lead to the best outcomes. Although it’s called Robotic Heart Surgery at no point does the robot operate alone, the surgeon is 100% responsible for every movement. The most obvious advantage of robotic heart surgery is the fact that there is no large scar on the chest since the procedure is performed through small incisions. Not only can this offer a cosmetic advantage but also decreased trauma, and less post-operative pain. There is a possibility of decreased need for blood transfusions, a decreased stay in the intensive care unit, decreased length of stay in the hospital, and a more rapid recovery with return to work. In the right hands, robotic heart surgery can lead to a smaller incision, less pain, shorter hospital stay, and a faster return to work. A surgeon’s view of robotic heart surgery. One of the most important aspects of undergoing robotic heart surgery is to have the surgery in a center where the number of cases being done is high, the experience level is high, and the results have been proven good. Robotic heart surgery is highly specialized and the learning curve is steep which means the results can be poor in the wrong hands. The good news is that the leading robotic centers have an infrastructure that is centered around robotic heart surgery and the outcomes are incredible. Centers of excellence for robotic mitral valve repair are a great example of this where repair rates may exceed those of conventional surgical centers. Probably the most important part of robotic heart surgery is having an experienced team. Heart operations were almost all done through large incisions in the chest wall and over the years a number of techniques were devised to allow smaller and smaller incisions known as minimally invasive heart surgery. Robotic heart surgery takes minimally invasive heart surgery to a whole new level. The most commonly used system is the FDA approved ‘da Vinci’ system. Robotic heart surgery allows for operations to be done through relatively tiny holes and can recreate the tiny delicate of movements. How Does a Heart Surgeon Use the Robot? Unlike conventional surgery, robotic heart surgery is performed by a heart surgeon who uses a console that is not directly next to the patient, but is somewhere else in the room. 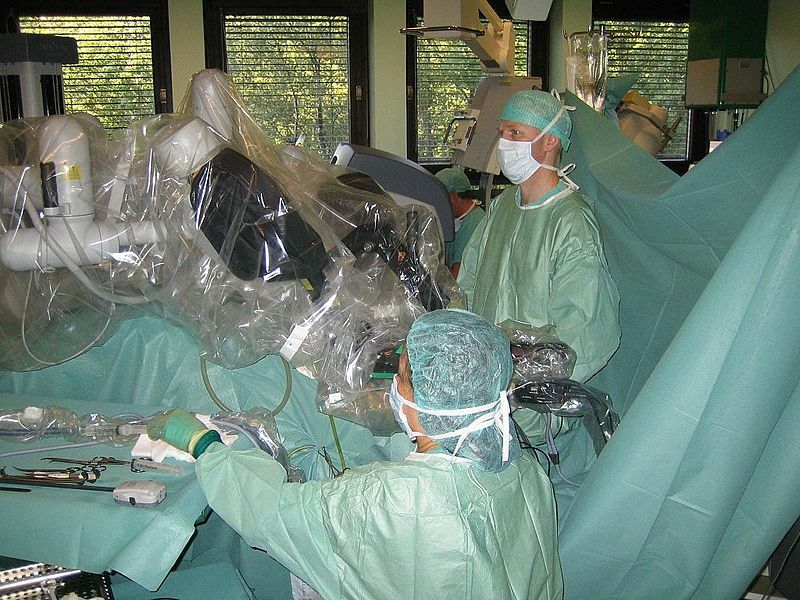 The surgeon sits at the console and the robot is positioned over the patient. The surgeon controls the robot from the console by using 2 master handles. Through the console the surgeon is able to see high resolution, three dimensional and magnified views. This allows robotic heart surgery with a high precision of movement and placement of micro-sutures, through a tiny incision. 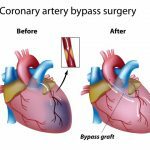 Coronary Artery Bypass Grafting – Bypass surgery is an operation used to treat blockages in the heart arteries. In certain cases this can be done using a robotic approach. Sometimes when there are a number of blockages, and a robotic approach is still preferred, then a combination of robotic surgery and stents can be used. The main advantage of bypass surgery is when a bypass is done on the Widowmaker artery on the front of the heart known as the left anterior descending artery. In a hybrid procedure, the bypass can be done to that artery and the other arteries treated with stents as required. Robotic Mitral Valve Surgery – This is the claim to fame of robotic heart surgery and where it has been most successfully applied. This can be for a leaky heart valve called mitral regurgitation or a tight heart valve called mitral stenosis. Expert surgeons can perform both mitral valve replacements and complex mitral valve repairs. Studies have shown that when performed by expert surgeons, the results are excellent. Mitral valve surgery is the most commonly performed robotic heart surgery. Robotic Tricuspid Valve Surgery – Tricuspid valve surgery can be successfully performed using the robot. This is most commonly for a leaky tricuspid valve known as tricuspid regurgitation. This surgery can be performed in a timely fashion with good results. Robotic Atrial Septal Defect Surgery – Atrial Septal Defects are holes between the upper chambers of the heart and people are usually born with these. These are typically closed using catheter-based techniques through the vessels of the leg. In some cases this cannot be done with catheters and robotic surgery can provide a good next minimally invasive option. Robotic Atrial Fibrillation Surgery – A number of techniques can be used to treat atrial fibrillation with heart surgery and these have been extended by some expert surgeons to treating with use of the robot. An Interview with Clifton Lewis MD, a world-renowned robotic heart surgeon who answers some commonly asked questions about robotic heart surgery. Dr Lewis has performed around 10,000 heart operations and incredibly almost 1000 robotic surgery cases. Dr Ahmed and Dr Lewis work together in the world leading Princeton Structural Heart and Valve Center in Birmingham Alabama where there are world class TAVR procedure, Mitraclip procedure and robotic heart surgery programs. Who is a Candidate for Robotic Heart Surgery? Clifton Lewis MD: Anyone with mitral valve disease is a potential candidate for a robotic mitral valve operation and we consider anyone who comes in with mitral valve disease a robotic heart surgery candidate until we prove otherwise. We then look closely at each patient and see if there are any reasons that we cannot accomplish it. Things that often mean robotic heart surgery is not possible include prior heart surgery on the right chest. Diseased arteries of the legs. There are some other technical issues that make protection of the heart difficult during robotic heart surgery. Commonly the need for other procedures at the same time rule out robotic heart surgery, such as the need to perform coronary artery bypass grafting or aortic valve replacement at the same time. Prior heart surgery or prior mitral valve surgery typically does not exclude patients from having robotic heart surgery. Is the Risk of Robotic Heart Surgery Different from Traditional Heart Surgery? Clifton Lewis MD: The complications that you can run in to can differ a little. 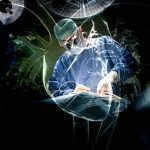 There is no real evidence to suggest that a robotic mitral valve operation, the most common type of robotic heart surgery, is either safer or more dangerous than a traditional operation. The advantage of a robotic heart surgery is quicker recovery and a nicer cosmetic result. There is some evidence suggesting a lower risk of transfusion with a robotic approach as well as a lower risk of infection. I personally feel that it is technically easier to repair a mitral valve through the right chest with a robot than with a traditional approach through the breastbone. 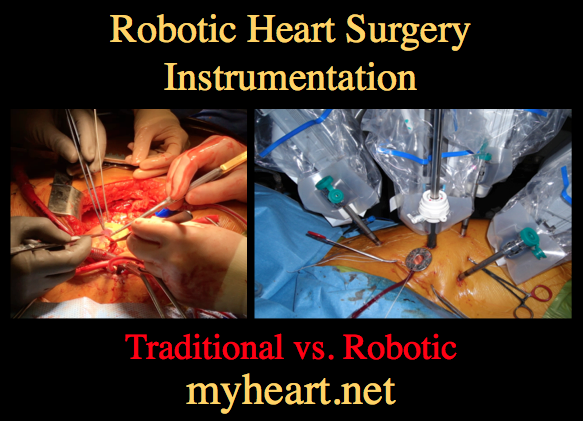 Traditional vs Robotic heart surgery instrumentation. What is the Recovery Time After Robotic Heart Surgery? Clifton Lewis MD: We define recovery as a return to normal activities. A traditional sternal incision is 2 months, with no driving for a month and no heavy lifting for at least 2 months. With a robotic surgery, it is typically only 2 weeks, so significantly shorter. Of course patients prefer this. A faster recovery and a less traumatic incision are the key factors that make robotic heart surgery the preferable option for many patients. What Restrictions are there After Robotic Heart Surgery? Clifton Lewis MD: We like people to not drive for 2 weeks or while they are on strong pain medication. We like people not to lift things heavier than 8 pounds after a robotic heart operation. After 2 weeks there are no restrictions. How Long Does a Robotic Heart Surgery Take? Clifton Lewis MD: Of course I now have the benefit of answering this question after having performed almost 1000 robotic surgeries! I now find that the time taken for a straightforward mitral valve repair operation is just under 2 hours. How Many Cases Have You Performed? Clifton Lewis MD: Total robotic heart surgery operations are almost 1000. The majority of those are mitral valve repair operations. Minimally invasive operations, close to 2000. Mitral valve operations in total close to 2000. Aortic valve operations, close to 3000. Total heart operations over 8000. 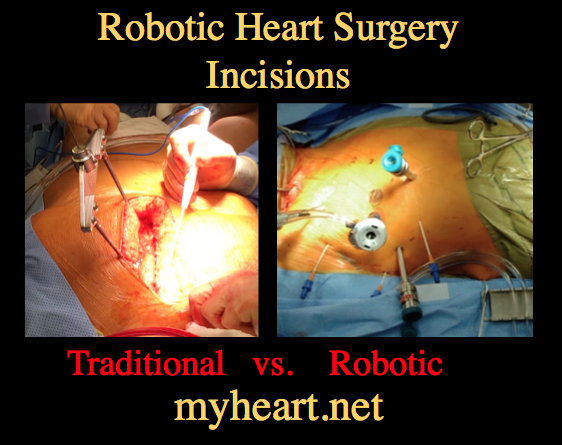 If You Were Having Mitral Valve Surgery would you have it Done Robotically? Clifton Lewis MD: Yes I Would. The issue with mitral valve robot operations is really one of less misery. I’ve had an operation before and been held out of work for several months and so anything that gets me back to work quicker with the same sort of safety is clearly something to be valued. The caveat to that is you have to find a place that does robotic operations and does them in large numbers. Unfortunately that is very few places. If you look at outcomes after 6 months or a year, the operations are similar; the main advantage of robotic heart surgery is the recovery. What Tests are required for Robotic Heart Surgery? Clifton Lewis MD: It varies depending on the operation required. Generally a heart catheterization and a trans-esophageal echocardiogram are needed. If a patient is a candidate, then a CT scan is performed to help plan an operation. A Number of Patients in the Princeton Baptist Structural Heart Program are from Out of State or Country. What Should These Patients Expect? Normally if our patients are a number of hours or more away we plan it so that the majority of required tests for robotic heart surgery are done close to home. Sometimes we will have to repeat the test in our institution. The CT scan is typically done here. We try to limit the time people have to spend here. We often organize it so people come in and are seen in the clinic, get their studies, and can be operated on within a day or two. If there are no complications then we people can go home within a week of their robotic heart operation. If patients do very well, they may not have to travel back after their operations. At Princeton we have a special lodge for patient families that is actually a part of the hospital. Its part of a large robotic heart surgery program. What are the costs of Robotic Heart Surgery compared to Conventional Surgery and where in Canada can this Surgery be performed? Robotic heart surgery, when taking in to account the entire hospitalization is similar to an open approach. Im not familiar with robotic heart centers in Canada. Robotic bypass 7 years ago and left breast and ribs still painful. I had a 2nd bypass and surgeon said the fist one who did the robotic botched it. You can only do so many bypasses with the robot so be aware. I have been diagnosed with Severe Mitral Valve Regurgitation with Flail leaflet due to torn Chordae. My EF is 58%, LVIDd: 5.9cm, moderately dialated left atrium there is mild tricuspid valve regurgitation, Mildly increased PASP. And Physiologic Pulmonic regurgitation. My question is that I have a date for surgery in a few months and the Surgeon would like to perform a Sternotomy. As far as the approach in my case goes is one approach better than another regarding a Sternotomy vs Minimally invasive approach? It all depends on the expertise available. In our center for example, in cases such as yours we are 100% robotic, we feel its a less traumatic approach, we have vast experience with it and excellent outcomes. Furthermore we feel the repair is better this way. I would always advise against going to a robotic program that has not shown good experience and outcomes, the learning curve is steep and it is highly operator dependent. If i had to choose in a center where the robot is not well established then i would advise alternative approach. The mini-MVR should be the standard of care for that setting, its a very small sternotomy. More importantly you need a guarantee of repair and not replacement. A valve like yours should never be replaced without an extremely good reason. Thank you Dr. Mustafa Ahmed and Dr. Clifton Lewis for taking the time to provide this amazingly detailed information. It is doctors like you who truly make a difference. Can robotic surgery be used for aortic valve replacement? As things stand this is not performed, unlike the mitral and other valves. I’m 69 yrs. old and had a 3D TEE done on 3 July 2018 at Princeton Baptist in Birmingham, Al; was told my mitral regurgitation was 3 on a scale of 1 to 5 and that surgery was not needed until it reaches 5. I was also told my heart is good shape and was 45 -50 with 55 being a healthy heart. I also have a-fib and I’m on a 5 mg dose M-W-F-Sunday and 7.5 mg dose on T-Thur.-Saturday of Warfarin blood thinner. 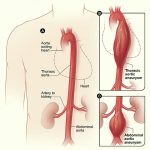 Repair options to my mitral valve was not addressed other than being told it could be clipped (mytraclip??) when it get to stage 5. I guess my question is why wait for additional damage to be done if repairs could fix the leakage and hopefully get rid of my a-fib / warfarin blood thinner. In general low moderate mitral regurgitation (3/5) is not fixed. There are a few reasons for this. Firstly, there is no good evidence that fixing this will improve heart function, most people tolerate this without any problem or further damage to the heart. Although close monitoring is required to ensure no worsening. Furthermore, in many cases of MR, treatment of heart muscle weakness itself can over time significantly reduce the regurgitation. Secondly its important to realize that no intervention on the heart, be it surgery or a catheter based method such as the clip is without risk. For that reason intervention should not be performed without compelling indication of benefit. Finally, intervention on the valve will not have an impact on the need to continue blood thinner. Hello, I am scheduled for open heart surgery on Sept. 17th. I have had the trans-esophageal echocardiogram and a heart catherization. I just found out about the robotic process and wonder what the next steps would be if I traveled to your clinic and how long before it could take place. The process itself would be simple however and out of town patients are common here, however its important the records are reviewed first to ensure a well coordinated visit and opinion. do yo need to get in from groin in robotic surgery? Some of the cannula placement is in the groin however the surgery is carried out through small robotic ports on the chest wall.